Having written steadily during his teenage and student years, David Earl officially launched himself as a composer at a Wigmore Hall recital in 1977, playing Piano Suite No 1 Mosaics. 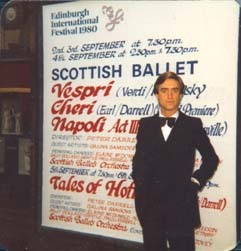 This work was followed by a Piano Concerto and his first commission - an hour-long score for Peter Darrell and The Scottish Ballet inspired by Colette's famous novel Chéri. 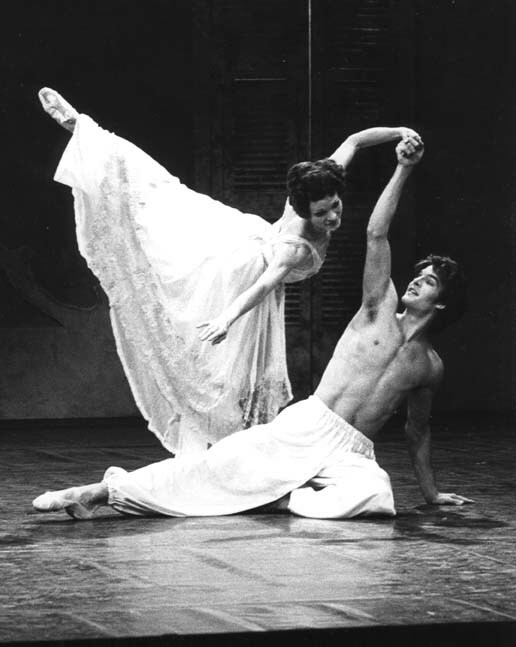 The ballet was premiered in September 1980 at the Edinburgh Festival with Galina Samsova and Patrick Bissell dancing the lead roles (photo, below). Philip Prowse was the designer. Chéri has received many subsequent performances, including those in a version for chamber ensemble for touring to small venues. It was given a new production by The Hong Kong Ballet in 1989. Piano Concerto No 1 was premiered in March 1980 in Cape Town with Christian Badea conducting the Cape Town Symphony Orchestra. Two further ballet scores were subsequently commissioned by the CAPAB Ballet in Cape Town. 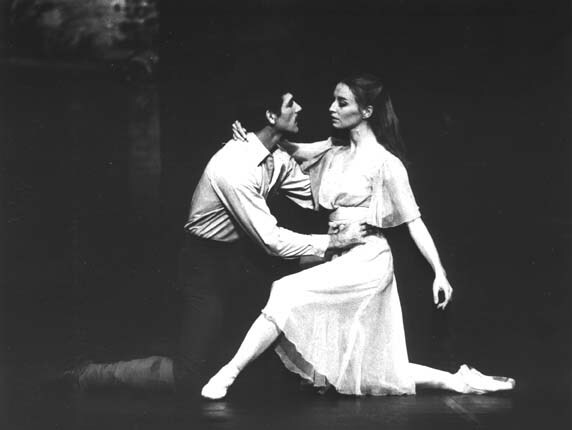 In 1982, with designs by Peter Cazalet and based on Rebecca West's novel, The Return of the Soldier (photo, below) was choreographed by Veronica Paeper, with the main roles created by Eduard Greyling and Cantinka van Vlaanderen. In 1985 the same team were involved in Abelard and Heloise - the score incorporating choral sections into the orchestration. Between 1982 and 1986 David was involved in several projects for television. P'Tang Yang Kipperbang, directed by Michael Apted with a script by Jack Rosenthal, was shown during the opening week of Channel Four. A second film, Arthur's Hallowed Ground, was directed by veteran cinematographer Freddie Young. Following these came a six-part series The Price, directed by Peter Smith with whom David worked on other independent projects. In 1986 David and Melanie Horne were the soloists in a Two-Piano Concerto which was performed by the Cape Town Symphony Orchestra under Enrique Garcia Asensio, the work being inspired by the legend of Castor and Pollux. The following year saw the completion of a choral symphony - Trumpets from the Steep - a setting for soprano, chorus and orchestra of Wordsworth's Intimation of Immortality. Piano Suite No 2 Gargoyles, based on the baroque dance suites, and Caryatids - Three Intermezzi made their appearance in 1990, as did the Violin Concerto which was premiered in June of that year with The Bardi Orchestra under Andrew Constantine, with Tasmin Little as soloist (photo, left). In February 1991, a full-length ballet based on Shakespeare's Macbeth was premiered by Ballet de Santiago in Chile, with choreography by Andre Prokovsky (photo, right: 2nd from right) and designs by Robin Don. Edgardo Hartley and Sara Nieto created the roles of Macbeth and his wife. 1993 saw the first performances of three new works - Oxymorons: 24 Preludes for Piano, performed at that years Grahamstown Festival in South Africa; Man's Medley - a setting of George Herbert poetry for soprano, chorus and orchestra (commissioned by The Charnwood Choral Society in Loughborough); and Sonata No 1 for Violin and Piano - especially commissioned for Tasmin Little and performed by her and Martin Roscoe. In 1995, a setting of Queen Victoria's Highland Journal, a dance-theatre project commissioned by The Scottish Arts Council, was given its first performance in Glasgow. Piano Suite No 3 Mandalas, inspired by Buddhist iconography, received its first performance the following year. Two works for cello appeared in 1998 - a Sonata for Cello and Piano, and a Cello Concerto. 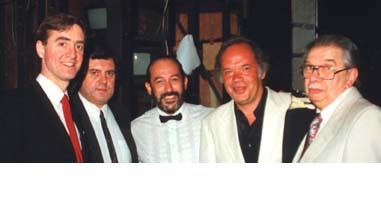 The latter was given its first performance by Alexander Chaushian with The Birmingham Sinfonia under Andrew Constantine. In recent years David has completed a Trumpet Concerto (2005), a Second Piano Concerto (2007), a Double Violin Concerto (2011), and Island Owl - a song cycle for soloists, children's choir and orchestra (2010). Chamber works include a Piano Quintet, Clarinet Trio and String Quartet. In July 2012 a setting of Rupert Brooke's The Old Vicarage, Grantchester for baritone, chorus and orchestra, commissioned by Dame Mary Archer to mark the poem's centenary, was given its first performance in Cambridge. Nicholas Mogg was the soloist, with Graham Ross conducting the Cambridge University Chamber Orchestra, with members of the choirs of Clare and Gonville and Caius Colleges. Recent first performances include the Clarinet Concerto, premiered in October 2013 in Durban, South Africa, with Maria du Toit and the KwaZulu Natal Philharmonic under Arjan Tien; and the University of Cape Town Wind Ensemble's first performance of The Wineland Suite conducted by Alex Fokkens in May 2014. (This work is also available fully orchestrated.) The piano pieces Old Roses, Barcarolle and Song Without Words have been performed and recorded by Renée Reznek. 2017's recitals in the UK, Germany, and South Africa included the premiere of Piano Suite No 4 Darshanas.